The breakout boards for the ATmega32u4 I got from one of my favourite online shops; Dipmicro. I soldered the microcontroller using my hot air station. I could have used my soldering iron, but that’s less fun. herein u have shown programming via USB. Say, i wld like to do via a serial port. Can i connect a FT232 and do the job. 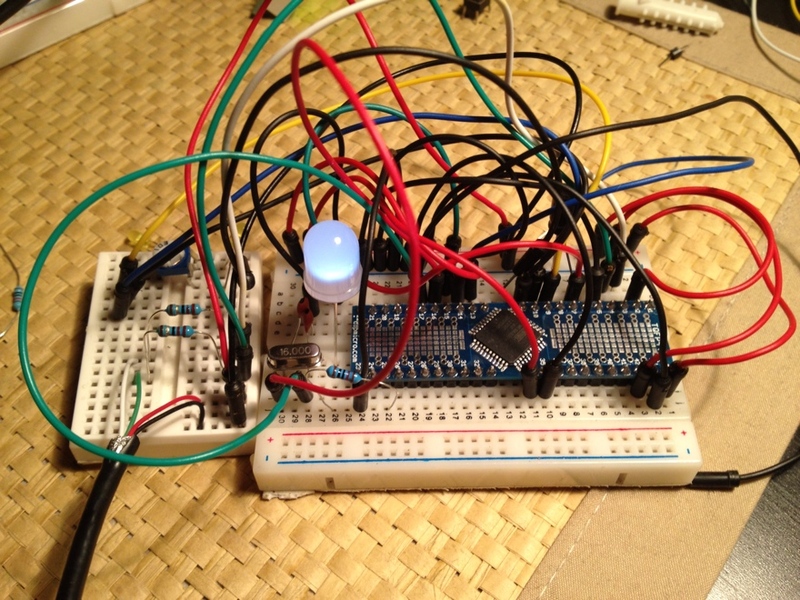 is not a mega AVR but a Atmel 8-bit AVR RISC-based microcontroller…. it can program itself over a usb as it has Native USB Capabilities (after burning the bootloader…. 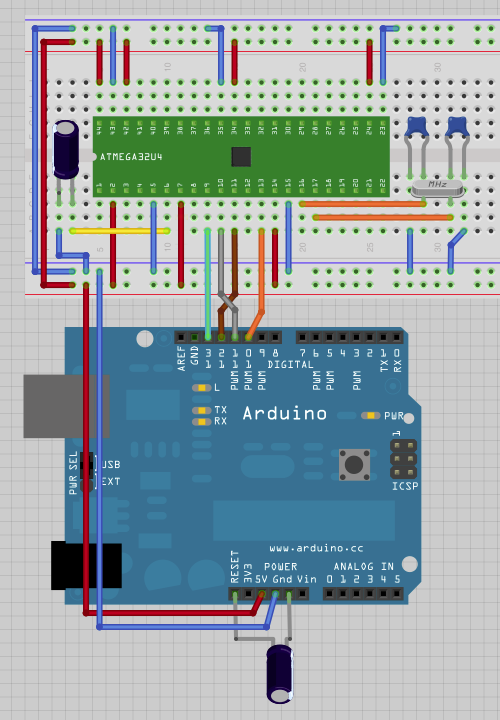 you will surely see arduino leonardo on your com port after you connect it using a simple usb cable……………………………. there is no way you can program it using the tx and rx pins of the ftdi chip.. if you need to program it externally you need an ISP (OR AVR ISP) OR USB ASP PROGRAMMER ……. YOU ARE ACTULLY USING THE UNO AS ISP as the name suggests Arduino as ISP………. u have connected pin 2 to GND. Its UVCC. Thanks – I’ll fix that. i don’t know the little trick from Leonardo. Big thanks! this error may be due to no proper selection of bootloader or not proper burning of bootloader. I am able to upload the boot loader. But, I wanted to program the Atmega32u4 via UART(Tx/Rx) pins. Can we do that. Thanks for the tutorial. I wasted my time trying other things that didn’t work. An awful lot of people are having problems with trying to program these 32u8 chip via USB. The Leonardo bootloader ONLY allows programming via USB. They need to change the bootloader to allow the FTDI option. It does not work for me unless I connected pin 7 (VBUS) to Vcc. Thanks! Only for me this setup didn’t work initially. I had to connect Vbus (pin 7) to VCC, which isn’t in the above schematic. After that it worked fine! After selecting “burn bootloader”, I am greeted with the error: “usbdev_open(): did not find any USB device “usb” bug”. Any thoughts on what I might try? Thanks! I followed your procedure and got the following response. Could you let us know which Version you were used and what’s the ArduinoISP.ino, i tried couple times but did not work? This was written almost 3 years ago now but I think it was Arduino 1.0.3 or something similar. I haven’t worked with the 32u4 in a while (and not with the newer versions of the Arduino IDE) so I’m afraid I probably can’t be of much help here. What error are you getting? Have you made sure all the connections are made as per the diagrams above? Ani am also confuse, Uno is using 328P, how will can program bootloader into 32u4? I check the connection again, which has followed your connection as well.But don’t know why? Maybe i can download old version to try it again. Thanks for the tutorial, it worked! But I would like to use the internal oscillator instead of the external crystal. Is it possible? Glad to hear it worked! It should be possible but I’m not 100% sure if this would require a modification to the bootloader itself. At the very least you would need to modify the boards.txt file to create a new entry for the ATmega32u4. You would need to change the fuse bits in there to use the internal crystal and also change the clock divider. For the fuse bits you’ll need to find a fuse calculator to figure out which fuse bits to modify and what value to set them to. I actually did exactly the same in this guide and it works perfectly! 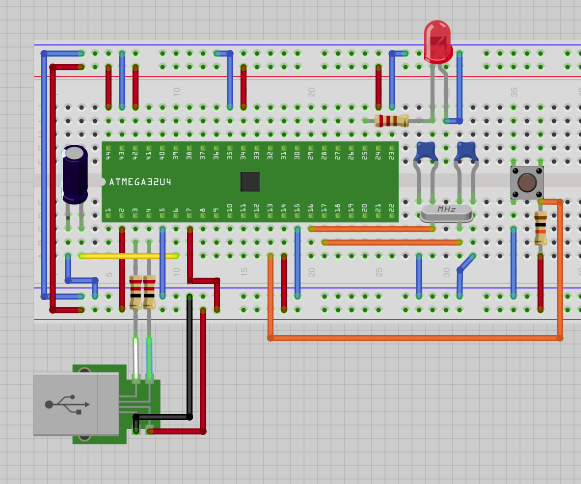 I’ll design another boards with atmega32u4 microcontroller based in this post, thanks a lot! I did follow this tutorial, but i got an error. Could you tell me which version of ArduinoIDE that you use? and What “programmer: ” did you selete before hit “burn bootloader”? thank you so much for this article, its great. Apparently there is no switch? So how is it possible to upload a sketch without a switch? I haven’t seen those guys before so I’m not positive. It might work without using the reset button, or you may need to add a reset button or just short the RES pin to GND. I’m not positive though and I would ask the seller if a reset button/switch is needed in order to upload the code. Did you choose 1. file-examples-ArduinoISP ? Then hit “Burn Bootloader” ????? I came across this article after searching for ISP Programming of 32u4 using Arduino Uno. You have wrote a nice blog. I want to tell you that I have a similar breakout board like yours. But I am finding it difficult to program. I don’t have a programmer but I do have an Arduino Uno. It would be helpful if you let me know how to program it (pin-outs). I want to ask, can I burn Micro Pro’s bootloader in the ATMEGA32u4, when I follow these instructions? I had a lot of problems with burning Leonardo’s bootloader to ATMEGA32U4. Eventually, I traced all issues with my PCB. Once those are resolved, I was able to burn bootloader with Arduino Uno. With the same Arduino Uno connection (i.e. ICSP pins), I could not upload the sketch. It turns out that you just need to connect ATMEGA32U4 to computer with USB connection. Just tried this and it still works with 1.8.4. If you are having problems double check your connections, then triple check them. I had a few things wired wrong and had many of the same problems listed here. You should use “Arduino as ISP” for the programmer and upload the ArduinoISP to the UNO you are using as the programmer.